Lynn just left for Oklahoma in our car. We rented a van to take Robbie back. He has appointments this week and hopefully we will get permission to leave on Thursday. We are all ready to be home! I really appreciate all Lynn’s help. We sent along a couple sloths to keep her company. Keep her in your prayers as she makes the long journey back to Tulsa by herself. Robbie is enjoying a quiet day resting at the hotel. He came home with multiple instructions for his care. I’m trying to make myself start, but changing and caring for a wound is another reason why I am thankful for nurses. You got this. It isn't even an icky looking wound. Think of it as putting on a big bandaid to cover the big boo boo on his knee. You don't even have to kiss it all better. Thanks Anne…you made me smile. Traveling mercies for Lynn! 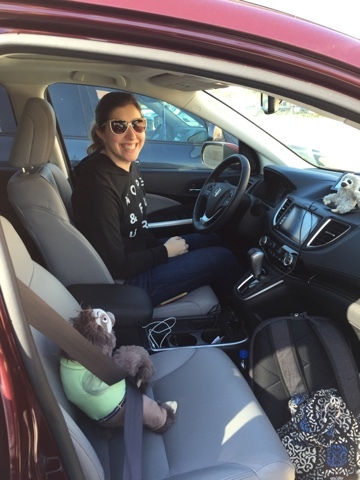 I'm glad to see that the sloth is safely seat-belted in!! !